Annotation: Richard P. Feynman was one of this century s most brilliant theoretical physicists and original thinkers. Born in Far Rockaway, New York, in 1918, he studied at the Massachusetts Institute of Technology, where he graduated with a BS in 1939. He went on to Princeton and received his Ph.D. in 1942. During the war years he worked at the Los Alamos Scientific Laboratory. He became Professor of Theoretical Physics at Cornell University, where he worked with Hans Bethe. He all but rebuilt the theory of quantum electrodynamics and it was for this work that he shared the Nobel Prize in 1965. His simplified rules of calculation became standard tools of theoretical analysis in both quantum electrodynamics and high-energy physics. Feynman was a visiting professor at the California Institute of Technology in 1950, where he later accepted a permanent faculty appointment, and became Richard Chace Tolman Professor of Theoretical Physics in 1959. He had an extraordinary ability to communicate his science to audiences at all levels, and was a well-known and popular lecturer. Richard Feynman died in 1988 after a long illness. Freeman Dyson, of the Institute for Advanced Study in Princeton, New Jersey, called him the most original mind of his generation , while in its obituary The New York Times described him as arguably the most brilliant, iconoclastic and influential of the postwar generation of theoretical physicists . 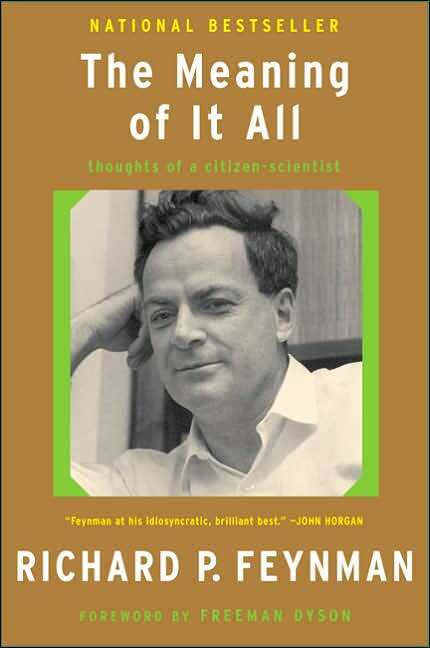 A number of collections and adaptations of his lectures have been published, including The Feynman Lectures on Physics, QED (Penguin, 1990), The Character of Physical Law (Penguin, 1992), Six Easy Pieces (Penguin, 1998), The Meaning of It All (Penguin, 1999) and Six Not-So-Easy Pieces (Allen Lane, 1998; Penguin, 1999). The Feynman Lectures on Gravitation and The Feynman Lectures on Computation are both forthcoming in Penguin. His memoirs, Surely You re Joking, Mr Feynman, were published in 1985.